Golf vacations can be wonderful getaways for couples, small groups of golfing buddies or corporate colleagues. However, expenses can easily go through the roof when staying and playing at prestigious resorts or world-class courses. Doing a little research and planning before your trip is time well spent and usually results in substantial savings. Whether your intent is to book your vacation yourself or get quotes from a package provider, you need travel dates and a confirmed number of players to start researching prices. You also need to have a destination in mind. Once a desired location is established, discuss the trip's budget with all who are pitching in. Decide on a financial range that everyone feels comfortable with. When planning a group vacation, PerryGolf recommends putting one person in charge who can listen to input and offer advice while being entrusted with important decisions. Knowing a few insider tips for saving money can give you an edge before you contact a package provider. Try working some of these ideas into your travel plans to get the best deals on golf packages. Peak golf season for warm, southern regions of the U.S., such as Florida, Arizona, Las Vegas and Southern California, is during winter months. Summer green fees in these areas can drop as much as 50-75%, according to Club Traveler. Brandon Tucker, managing editor of Golf Advisor, says golf is most expensive in Myrtle Beach, South Carolina during late March and April. Golf and lodging is cheapest there from late November to early January. 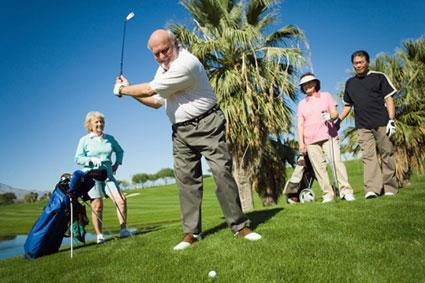 Atlantic City Golf Vacations recommends adjusting your dates of stay if possible to get reduced rates. Monday through Thursday is usually cheaper at most golf courses and hotels than Friday, Saturday and Sunday. If you can travel during the week, you can save quite a bit of money. Prime tee times are early in the morning. Many courses offer discounted twilight rates later in the day, starting as early as noon. Club Traveler reports rates as low as 30 to 60% off standard fees when twilight rates apply. If you're up to a full day of golf, you can get as much is a 50% discount on your second round. It's cheaper to play 36 holes in one day than to play 18 holes over the course of two days. Some courses may also offer a free lunch when playing 36 holes in a day. If you're traveling with a larger group that requires multiple hotel rooms, look into splitting the cost of a condo or golf villa instead of booking individual rooms. It might be more economical than the resort room rates and you could also save money by buying groceries and eating in. Golf expert Tony Smart recommends traveling without your golf clubs, as airlines can charge up to $100 each way for carrying a golf bag. If you really want to play with your own clubs, consider shipping them to your travel destination instead of checking them as luggage. Ship Sticks will pick them up from your home or office for cost-effective shipping. If you do leave your golf clubs at home, you'll need to rent clubs when you get to your destination. Renting off-site may be better than renting at the place where you will be playing. Club Traveler indicates that the course rate for rental clubs is usually about $75, but that you can often get better, customized mixed club sets for half of what most golf courses charge. Look for specialty golf rental shops near the resort, airport or golf course. If you have played all the rounds included in your package and have some extra time before driving or flying home, you may want to check online for last-minute discounts on golf courses in the area. Websites such as Last Minute Golfer, GolfNow and Golf18Network specialize in liquidating unsold tee times with a 24 to 72 hour lead time. Check for last minute discounts in multicourse locations such as Hawaii, Las Vegas, Scottsdale and Orlando. Always speak with a golf travel specialist before booking to see if they can help you find additional discounts or options for saving money on your trip. They can also provide custom quotes and itineraries to match your specific needs. Visit a few golf vacation package providers to see what deals are being offered. According to Brandon Tucker, the savings do add up, as you can often find incentives such as a free round of golf or a free night at a hotel. Each package is different, but all of them will have room accommodations and golf play. You can also find all-inclusive packages covering all meals, snacks and beverages. Be sure to read the information carefully and talk to a specialist before booking. Contact information for specialists handling a specific area is provided with the package details. Take advantage of the online chat offered on the website during normal business hours. Custom quotes can be obtained by filling out an online form or speaking with a specialist by phone. Car rentals can also be added to a package. For most golf courses, tee times can be booked 60 to 120 days in advance. Golf Trip Junkie does not book commercial airline flights but does offer a private charter jet for custom golf packages. Golf Trip Junkie offers a few comparison examples of golf trips booked through their package rates versus booking direct at locations such as Scottsdale, Orlando, Myrtle Beach and Palm Springs. Using the exact same travel itineraries, package savings range from just under $2,000 to just under $600. Founded in 1975 by a retired corporate executive, Golfpac Travel originally handled the demands of winter 'in-season' golf vacationers wanting to book advanced tee times in Florida. The company has grown with the market, offering year-round service to popular golf destinations throughout the U.S. and international destinations such as Scotland, Ireland, England, Portugal and Spain. Browse through Golfpac's established deals and promos to search for free nights, free rounds of golf on replays and unlimited play. Research hotels and golf courses at the many destinations they serve and get quotes on custom packages. Tee times can be booked 60 to 120 days in advance and reservations on packages can be confirmed with a $75 per person deposit. The number of packages and quotes to compare when looking for a good deal on a golf vacation is up to you, but reviewing several options can help give you an idea of what to expect. When comparing packages, try to keep the itineraries as similar as possible. Even so, you'll likely end up with some variations such as different lodging, car rental companies, golf courses or tee times. This is when the expertise of a golf vacation specialist can help the most, providing sound advice and logical reasons as to why this hotel or that golf course. Some sites also offer a price match guarantee if you find a cheaper price on an identical package itinerary. Transportation to your desired destination is up to you in most cases, so airfare is another consideration to keep in mind if you are looking at a destination beyond a reasonable driving distance. It is crucial to read the fine print and understand all the details of what the package includes to ensure you are getting everything you expect. Go over the cancellation policy in the event of unforeseen illness or circumstances that might prevent you or your companions from traveling. Ask about refunds on golf vouchers if rain or bad weather prevents you from being able to play. Once you know all the costs and variables, you can then decide, with your traveling companions, which package best fits your needs and budget. Although it might seem a little time-consuming at first, doing your homework can result in big savings on your golf vacation. Celebrate your savvy trip planning with a nice dinner when you get there, knowing you can look forward to a great golf vacation.